Background Developing a conceptual framework to underpin the design of qualitative research is often regarded as integral in enhancing its trustworthiness. However, this can often present a challenge to the novice researcher. Aim To discuss the approach taken to develop the conceptual framework underpinning a constructivist grounded theory doctoral research study. Discussion Drawing on a clear and accessible approach can help researchers to develop a conceptual framework to underpin qualitative research. A recognised example of such an approach requires the researcher to address three main elements: personal interest, topical research and the theoretical framework. Constructing a conceptual framework to underpin qualitative research can afford it structure and lay the foundations to support trustworthiness. Conceptual frameworks are often developed through a dynamic and iterative process that evolves throughout the research process. 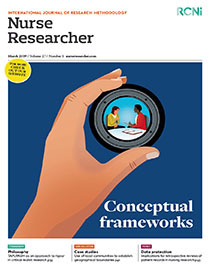 Conclusion Using an accessible and unambiguous approach to support the development of a conceptual framework can benefit novice researchers and minimise the challenges they may encounter. One such approach guides researchers to clarify a personal interest in the topic, undertake a topical review of the literature informing the area of investigation and articulate the theoretical perspectives that influence their worldview. Implications for practice The discussion presented in this paper offers a valuable contribution to help novice researchers to construct conceptual frameworks.